Our tree is up! Every year I like to put it up before Thanksgiving since that gives me more time to enjoy this favorite tradition without mourning that our time together was too short once I’m putting everything away come the new year. Per usual tradition as well, I go with a theme for our tree and this year I’m feeling white, silver, and red. Going back to classics but it still feels fresh! Initially I had different plans but quickly changed them when I found these gorgeous ornaments, which are all from Michaels (including the tree!) 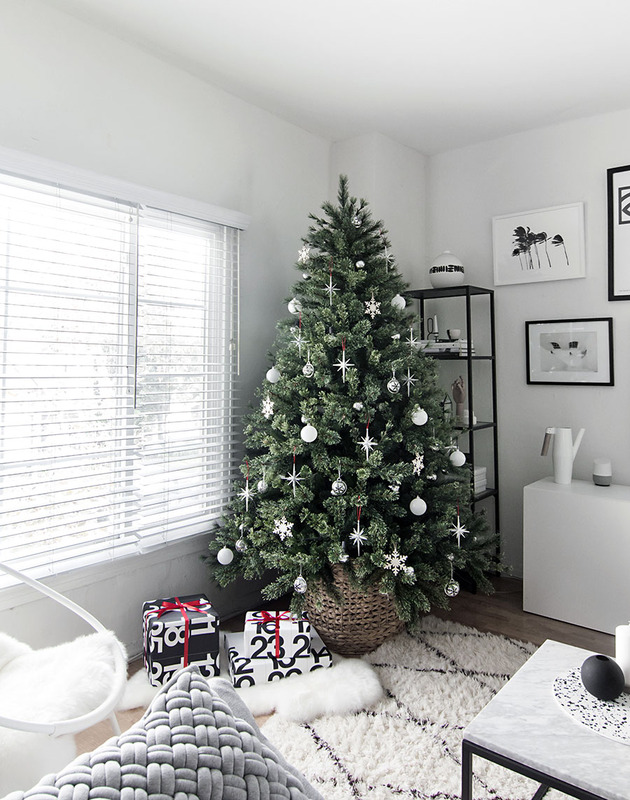 who I’m partnering with for the Dream Tree Challenge to share how I put together our modern, minimal tree. By “minimal” I mostly mean that you can see the majority of the tree itself. I always like to decorate the tree this way, especially when it’s pretty like this one. This is the 7.5ft pre-lit Jasper tree and I love that it looks fuzzy and as close to looking real as a faux Christmas tree can. A few years ago I added string globe lights to our tree and did it again this year because of finding these half dipped silver ones (at Michaels, everything on the tree is from Michaels for real.) I love that when they’re not turned on they look like regular silver ornaments, but when lit up they add an extra glow and dimension to the tree. Snowflakes also seem to be what I’m into this season with the wood snowflake ornaments and silver snowflake jingle bell ornaments, adorable. The shimmering star bust ornaments are my favorite though and what inspired me to bring back red this holiday even if only in the smallest ways. The ornaments came with the red ribbon and I adore the way it stands out while being a subtle detail. It spurred my plans to wrap all presents with red ribbon this year too. About that wrapping paper- they’re old sheets from my Stendig calendar that I get every year, meaning that I have a lot of sheets piling up in my closet waiting to get recycled, meaning I’m going to use this paper to wrap all presents forever. Luckily it’s my favorite wrapping paper of all time. About that basket. It’s my favorite detail every time, and I’m guessing it’s yours too because I get a lot of questions about it whenever it makes an appearance. It also pains me to tell you that it was a HomeGoods find years ago and I don’t know where else you can get it unless you come across one by fate like I did. I can tell you it’s roughly 22″ in diameter and that it does not fit a standard tree stand. This tree sits in the basket just fine without one though! I support any tree that looks like it’s on fire when it’s lit up, but I’m thinking this time I prefer these specific globe lights more when they’re turned off (here they’re turned on). Finding out in general that I like softer light for a tree, but the extra bursts of shine are definitely magical (word used by my husband when he saw the tree, aw). 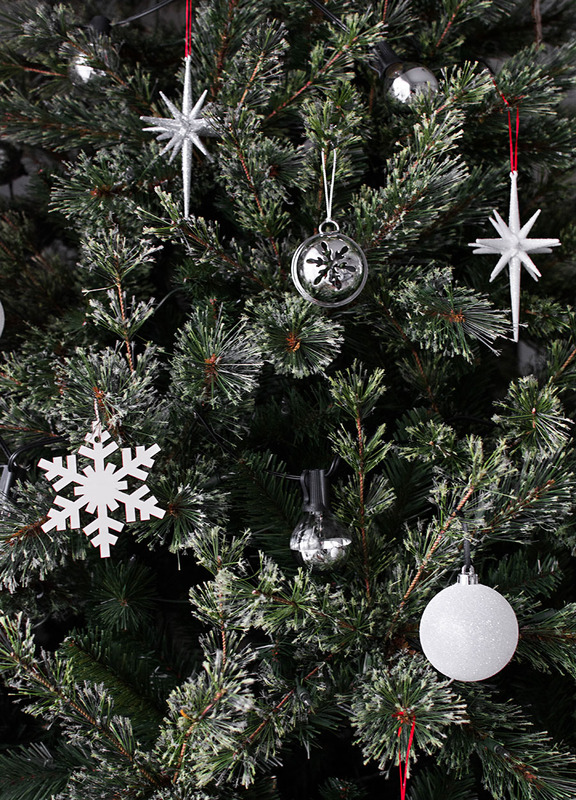 Have you put your tree up yet? 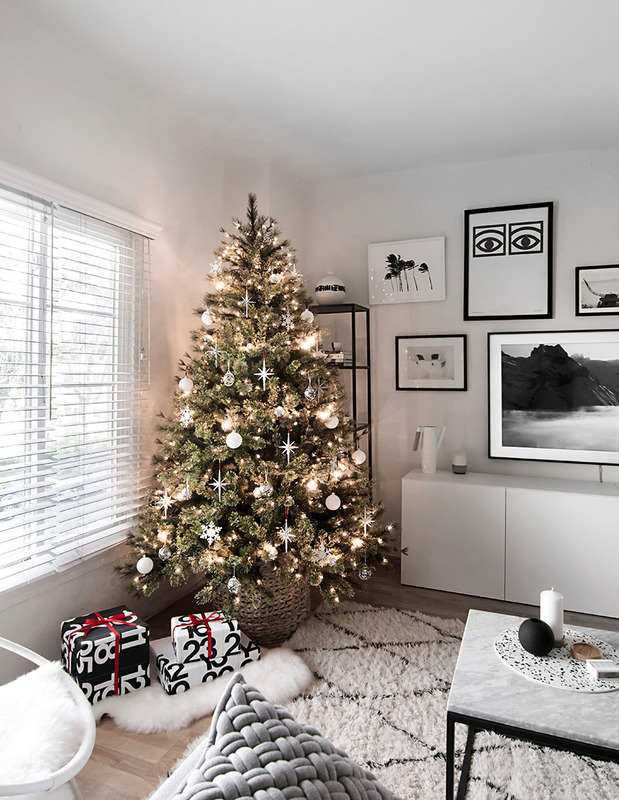 Anywhere else you decorate for Christmas in your home? I’m tackling that one next! 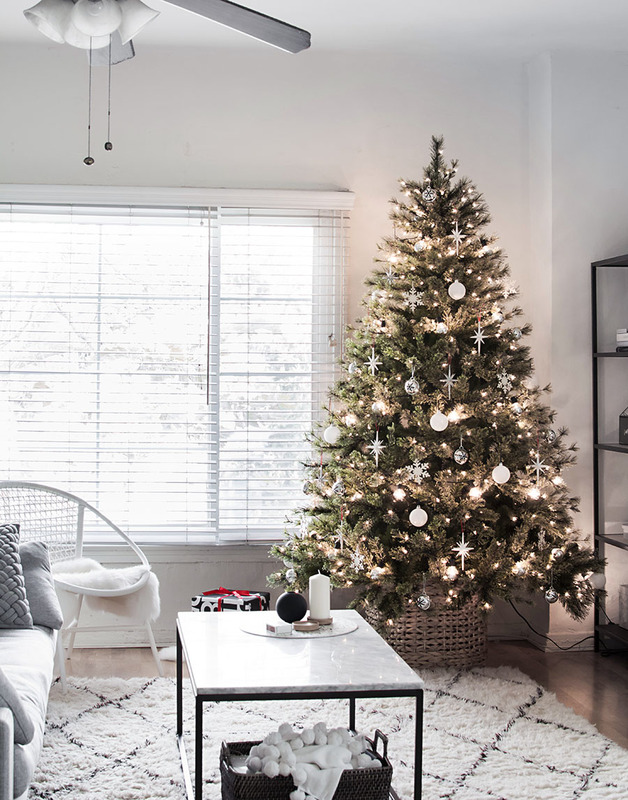 I really like that it’s not so packed with decorations, I think it’s just right! so pretty, soft and simple. 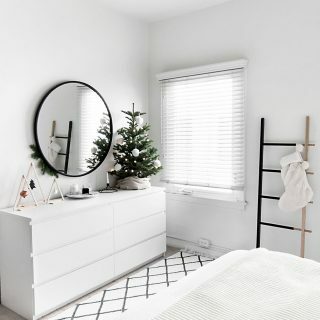 may i ask what color white you use on your walls? i am on the hunt to completely repaint my new/old townhouse. Hi Mary, the wall color is Dunn Edwards Swiss Coffee. Congrats on the new place! Hi. About the Standig calendar, is it do you know if 2017/2016 are available anywhere? Hi Ana, I haven’t seen the old calendars sold anywhere. I’m doing inventory this weekend to see what I am because the day after Thanksgiving this tree is going up! I’m so excited! 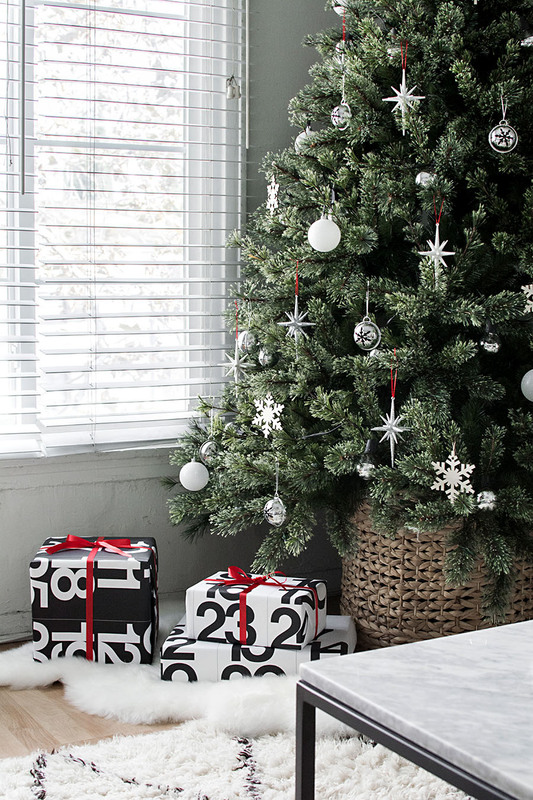 Your tree looks awesome and I may recycle some of my calendar paper the same way too. It’s genius. Happy holidays! Oh My goodness that tree is just STUNNING!! Wow, that tree is so magical! Now I really want Christmas! 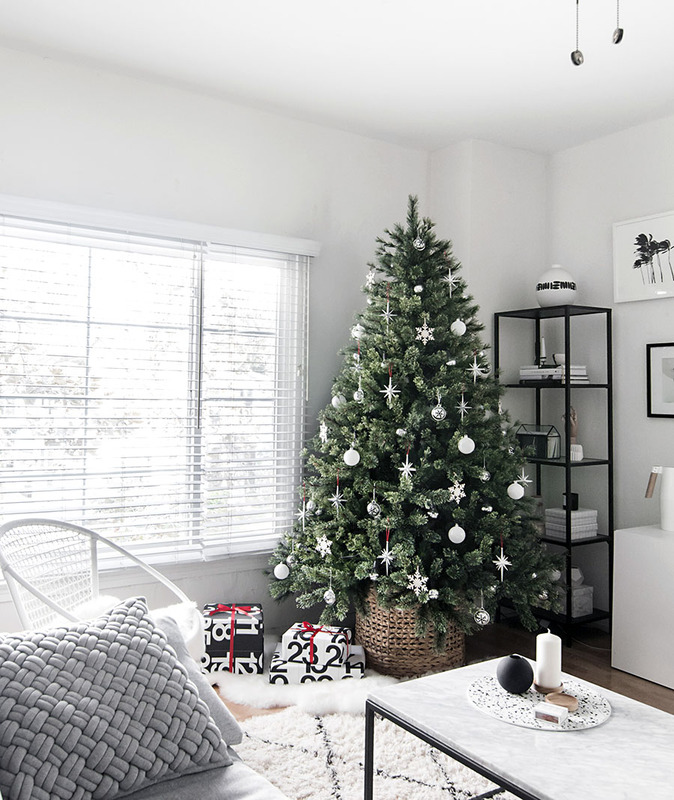 I love the minimal trend, love how simple the tree is. I have not brought the tree out yet, I guess I’ll do it this evening. Thank you for sharing the post! 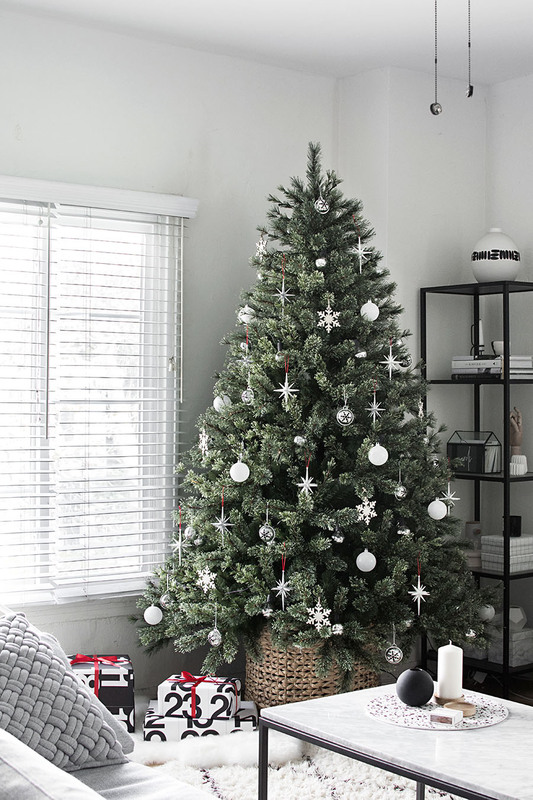 where did you get your box stand for your tree? i love it!!! Thank you! It’s a basket, I got it from HomeGoods a few years ago. I love the globe lights so much! Where did you get the lights from? 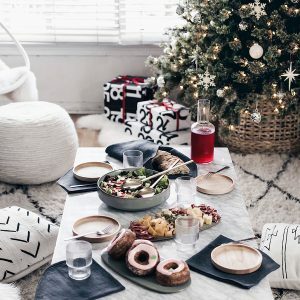 Are they just simple patio globe lights or they are specifically light for the Christmas tree? Yup, they’re the same as the globe lights you’d hang up for a patio! Hello, love your style! Where is the rug from? I want a six foot pre lit Christmas tree with bright lights Micheals Jasper tree please. I love that tree so much .